Hurricane Sandy was a tragic event for Staten Island, one of New York City’s 5 Boroughs. More than half of the deaths that occurred in New York City during the storm occurred on Staten Island. The storm resulted in extensive flooding, power outages and downed power lines across the Borough. Once home to an extensive network of tidal wetlands, nearly two-thirds have been filled in and developed. Of the remaining wetlands across Staten Island, estuarine emergent wetlands, or tidal salt marshes, predominate. Palustrine emergent and forested wetlands (inland freshwater wetlands that lack flowing water) are also found spectacled across the landscape. 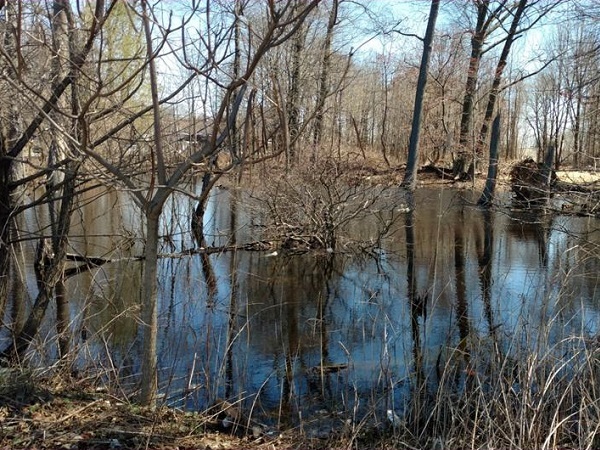 It was these wetlands that protected some residents from flooding during Hurricane Sandy. Residents of Graniteville, a predominately African American and Hispanic neighborhood in the north west section of Staten Island, attribute coastal flood protection during Hurricane Sandy to a 30-acre wetland known as the Graniteville Swamp and Forest on South Ave. The wetland has both freshwater wetlands and tidal influence from Arthur Kill. The residents living on the east side of the wetland did not flood and point to the functional benefits that the wetland provided, including water retention, wind blockage, and reduction in the energy brought on by high storm surges. Future flood maps produced by New York City government, including New York City Planning and FEMA, show increased risk to the neighborhood—a mobile home park with approximately 120 homes sits just to the west of the wetland is at total risk of inundation under future flood scenarios. Residents are concerned about high tide flooding, storm surge flooding and heavy rain events. Adding to this worry is a pending proposal to build a BJ Wholesale Club and additional retail on 18 acres of the Graniteville Swamp. Currently, applications for permits to allow the builder to proceed are currently being reviewed by the New York State Department of Environmental Conservation (NYSDEC). Initial permits applied for prior to 2012 were denied as NYSDEC identified the area as wetland. In August 2012, two months before Hurricane Sandy, a subsequent lawsuit settled in favor of the developer that the land is a forest and can be developed. The Coalition for Wetlands and Forests was established to raise awareness about the proposed destruction of the Graniteville Swamp and how its loss will impact residents. The group is comprised of residents, civic associations, condo associations and environmental groups. Together, they rally every Saturday morning, canvass to talk to residents, write letters to their local elected officials, and organize educational forums on topics such as environmental racism. Residents fear what will happen to the important wetland benefits they receive if the development moves forward. The Coalition of Wetlands and Forests would like to find a scientific partner who can determine whether the Graniteville Swamp is in fact a wetland and provide written evidence to document that classification. They would also like documentation of the flood risk that Graniteville is facing. The goal of this Thriving Earth Exchange project is to bring scientific evidence and understanding to the questions and priorities of local residents, so that residents can use that science to make decisions and take actions. This project has been conceived and designed in partnership with community leaders at The Coalition for Wetlands and Forest and with our national partner, Flood Forum USA. Gabriella Velardi-Ward is the founder of Coalition for Wetlands and Forests in Graniteville, Staten Island, NY. Gabriella is an artist, photographer, architectural designer and priest. As part of her architectural degree she studied ecology and urban planning. She worked for the NYC Department of Parks and Recreation (DPR) for 23 years as a designer and construction supervisor. As an architectural designer, she represented DPR to the Mayor’s Office of Construction for Sustainable Construction and helped formulate policy, city wide, for large public projects, which now require sustainability in design and construction. In 2017, she called together Staten Island environmental groups, civic associations, condo associations and people who care, and formed the Coalition for Wetlands and Forests in order to prevent the destruction of the Graniteville Wetland Forest. If the wetland forest is lost, this environmental justice community will be at high risk of flooding. The wetland is the only buffer against climate change and air pollution from the many sources of toxins around the community. Sarah Lipuma is an environmental researcher based in New York City. She is employed as Research Assistant at the Hudson River Foundation, a not-for-profit organization which promotes environmental stewardship and scientific research in the Hudson River Estuary. She volunteers for the Coalition for Wetlands and Forests, a grass-roots community group in Staten Island that aims to protect a wetland from the development. She plans to attain a Master’s Degree in Environmental Policy to explore climate change adaptation through the lens of climate justice, to make sure discriminatory policies in land use are not repeated and worsened by the destructive effects of sea level rise and flooding. Ericka Naklicki is a Principal Environmental Scientist for T&M Associates in New Jersey. She has 17 years of experience in the field of environmental consulting. She is certified as a Professional Wetland Scientist (PWS) by the Society of Wetland Scientists. Her areas of expertise include wetland delineations as well as the preparation of applications and final reports to the regulatory agencies. In addition, she is experienced in the preparation of Geographical Information Systems (GIS) maps for various project types including wetlands, floodplains, threatened and endangered species, aquifer and land use maps. She also has experience using Global Positioning System (GPS) surveying equipment.